The Apartment Casa El Duque is located on the first floor of a very quiet complex, which is part of the exclusive zone "Playa del Duque". Equipped this apartment is very luxurious with a living room with leather sofa, TV with all the satellite channels, wireless Internet, modern dining room and an American kitchen with breakfast bar. The kitchen is very well equipped with a dishwasher, microwave, oven, electric cooker with ceramic hob, toaster, coffee maker and kettle. There is also a washing machine. There is a bright and modern bathroom with bath and shower and a separate toilet. Both bedrooms have built-in closets. In addition, the apartment has a large terrace, which invites you to relax in the afternoon and soak up the sun. They can enjoy a fantastic view of the mountains and the sea. The sunsets from the terrace are beautiful. The complex is part of a heated swimming pool with a beautiful garden, a children's pool is available. Information about the location: The area of ​​El Duque is a stylish and very desirable resort in the sunny south of Tenerife. The beach of Playa del Duque is less than 400 meters from the apartment. There are along the new and well-kept promenade numerous shopping centers and restaurants. 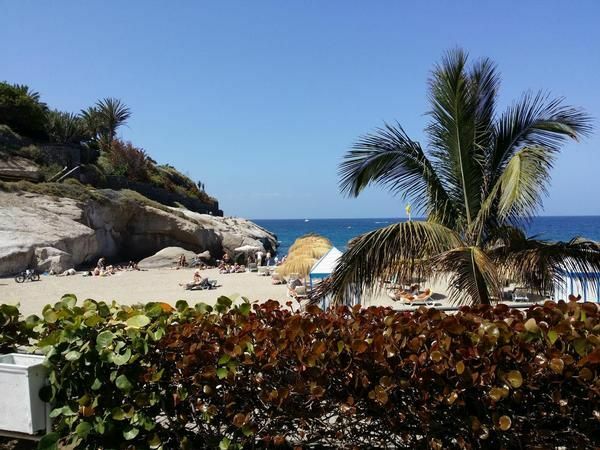 The Playa del Duque in the Costa Adeje is a beautiful sandy beach and is about 700 m long with palm trees, luxury hotels and a beautiful promenade. In addition, there is the castle of the Spanish royal family in El Duque. With an upscale ambience, elegance and attentive service convince the luxurious hotels and restaurants of Playa del Duque. Around the Plaza del Duque offer small boutiques and fashion stores high-end designer fashion, watches and jewelery. Here it is worthwhile to shop in peace and stroll. Situated on the quiet sandy beach of Playa del Duque in the Costa Adeje lure umbrellas made of bamboo and gorgeous fine sand. Not far away is the small fishing village of La Caleta, which has a handful of bars and some excellent seafood restaurants, where you can enjoy a traditional and typical Canarian atmosphere. To the east of El Duque of Playa de las Americas, with its many bars and restaurants. You can reach in a few minutes. There are 5 golf courses nearby, within a few minutes drive to Costa Adeje golf or to Abama golf. Also Siam Park is not far away. It is Europe's largest water park.